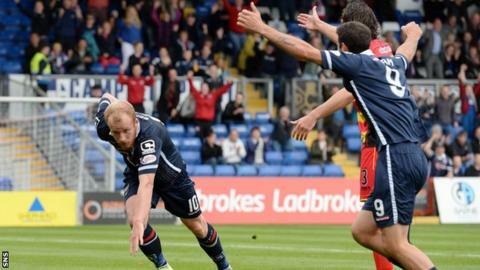 A Liam Boyce header was all Ross County needed to beat a Partick Thistle team that remains winless at the foot of the Scottish Premiership. Boyce guided home a Jamie Reckord cross to convert one of the few clear-cut chances of a poor spectacle. Sean Welsh was denied by County goalkeeper Scott Fox and Chris Robertson headed powerfully over at the other end. And, as time ticked away, Robbie Muirhead drew a save from Fox. The result moves Ross County to within a point of third-place Hearts ahead of their tricky home game against high-flying Aberdeen on Sunday. By contrast, Alan Archibald's Partick Thistle are rooted to the bottom of the division and the reason why is all too clear after an eighth game without a win. They have only scored two goals all season and it's now an incredible 462 minutes since Kris Doolan got the last of that pair. It was an indication of how little there was to get excited about early on that the Jags fans concentrated on taunting their former keeper Fox while the County supporters saluted Dundee United's Billy McKay's goal against their Highland neighbours Inverness at Tannadice. That all changed for the Staggies fans when their side hit the front with a goal of delightful simplicity as Reckord sped clear down the left flank. The full-back's curling cross was perfectly flighted and placed to allow Boyce to steer in his sixth goal of the season with a text-book header. Thistle found it hard to get bodies far enough forward to support lone striker Doolan at times but they very nearly scored on a rare counter attack. The home defence was caught too far up the park as Doolan spotted the run of Welsh in the inside right channel and sent him clear with an adroit pass. The midfielder drilled in a diagonal shot but was frustrated to see former Fox pull off an impressive diving save. Jim McIntyre was without several key players because of injury and the Ross County manager's luck did not get any better at the start of the second half. Michael Gardyne was forced off with an knock in 51 minutes and replaced by Jonathan Franks, who himself was not fit enough to start the game. It looked like Martin Woods would join the casualty list when he accidently twisted his knee and the club physio initially signalled the player was done for the day. However, the midfielder recovered quickly enough to return to the field and curl a 30-yard free-kick narrowly wide of Thomas Cerny's left-hand post before eventually giving way to Stewart Murdoch. It's a measure of how difficult the visitors found it to get near the home goal that it took them 55 minutes to win a first corner and even then there was no threat from the delivery. At the other end, Jackson Irvine whipped over an outswinging corner from the left and Robertson nodded over. Tony Dingwall replaced the ineffectual Brian Graham up front for County but having lost a late leveller at Motherwell last week McIntyre must have been concerned at how deep they defended late on. Muirhead very nearly provided an equaliser for the Jags near the end with a powerful 25-yard drive but Fox made a marvellous block. Then, in stoppage time, Steven Lawless missed a golden chance to earn a precious point and finally end that goal drought but, from six yards, hooked his shot over. Match ends, Ross County 1, Partick Thistle 0. Second Half ends, Ross County 1, Partick Thistle 0. Attempt missed. Steven Lawless (Partick Thistle) left footed shot from very close range is just a bit too high. Attempt missed. Robbie Muirhead (Partick Thistle) left footed shot from the left side of the box is just a bit too high. Corner, Partick Thistle. Conceded by Scott Boyd. Mustapha Dumbuya (Partick Thistle) wins a free kick in the attacking half. Attempt saved. Robbie Muirhead (Partick Thistle) left footed shot from outside the box is saved in the bottom right corner. Attempt missed. Sean Welsh (Partick Thistle) right footed shot from outside the box is close, but misses to the right. Raffaele De Vita (Ross County) wins a free kick in the attacking half. Attempt blocked. Robbie Muirhead (Partick Thistle) right footed shot from outside the box is blocked. Substitution, Ross County. Stewart Murdoch replaces Martin Woods because of an injury. Substitution, Partick Thistle. David Amoo replaces Stuart Bannigan because of an injury. Substitution, Ross County. Tony Dingwall replaces Brian Graham. Attempt missed. Chris Robertson (Ross County) header from the centre of the box is just a bit too high following a corner. Corner, Ross County. Conceded by Mustapha Dumbuya. Brian Graham (Ross County) wins a free kick on the left wing. Substitution, Partick Thistle. Robbie Muirhead replaces Ryan Stevenson.